Description: The seeress Huldr chanting incantations in the presence of Gísli and Öndr, the sons of King Vísburr. 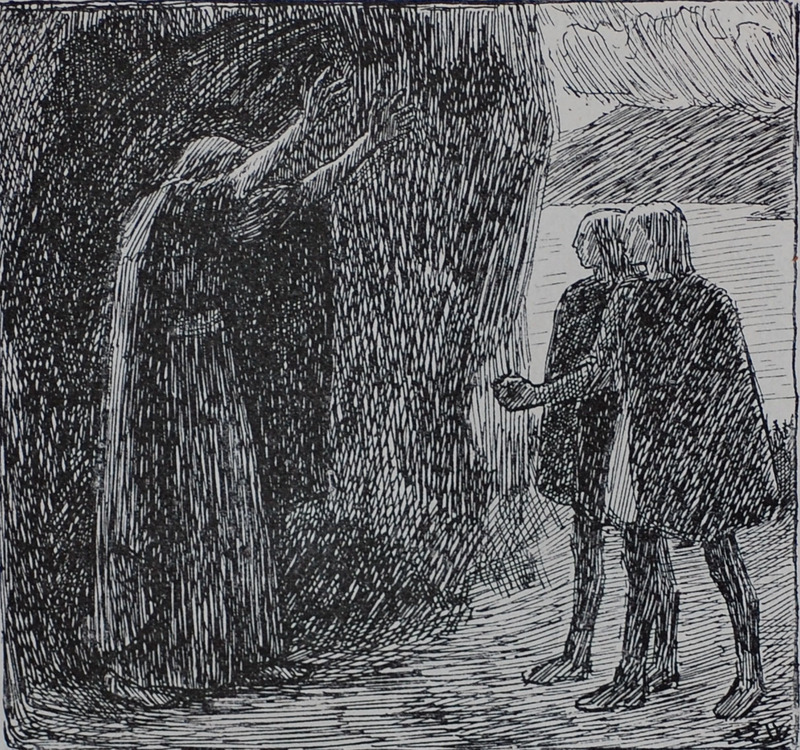 This illustration is from Chapter 14 in Ynglingesoga, the first saga in Kongesagaer, in Gustav Storm 's Norwegian translation of Snorri Sturluson's Heimskringla. The seeress in Ynglinga Saga, the first saga in Heimskringla, who at the request of Gísli and Öndr, the sons of King Vísburr, placed the curse on the Ynglings such that a murderer of his own kin would never be lacking in the Yngling race. One of the sons of the sons of King Vísburr in in Ynglinga Saga, the first saga in Heimskringla who tried to recover their mother's dowry from their father and had the seeress Huldr place a curse on the Ynglings when he refused. The two brothers then murdered their father. One of the sons of King Vísburr in Ynglinga Saga, the first saga in Heimskringla, who tried to recover their mother's dowry from their father and had the seeress Huldr place a curse on the Ynglings when he refused. The brothers later murdered their father. A king in Ynglinga Saga, the first saga in Heimskringla, who was burned to death in his hall by his sons because he had rejected their mother and refused to return her dowery.